Christmas Eve and I’m not ready. There are still presents to be wrapped and decorating to be done. I collect greenery from the garden to decorate the dining room, so that must be done at the last moment, otherwise it will not last until Twelfth Night. I haven’t made the mince pies yet – I have no lard to make pastry – I must go shopping for those last-minute ingredients. Before all that I just wanted to wish all my readers a Happy Christmas. I will try to blog a bit more regularly – I have several book reviews up my sleeve – perhaps next week! And I have a present for you, two in fact. Like the best (or worse) Christmas Presents they are “re-gifted” from previous Christmases. One is the piece of writing that started all this off. I used to be a genealogist – still am when I get the time. I thought it would be a good idea to write a genealogy story for Christmas. I tried and failed. What was different from all that factual writing I had done? A few weeks later, in January 2013, I joined a writing class. The rest is history, or rather Historical Fiction. Six months later, I wrote my Christmas story. You can read it here. The second is the story I posted last Christmas. Well, I hope I have acquired a few more readers in the last year! It is a story about Byrhtnoth and his meeting in the snow with – Who? Read it and find out. I will be back soon with a review of the past year and looking forward to what I hope will be an interesting new year. A very happy Christmas to you and yours. 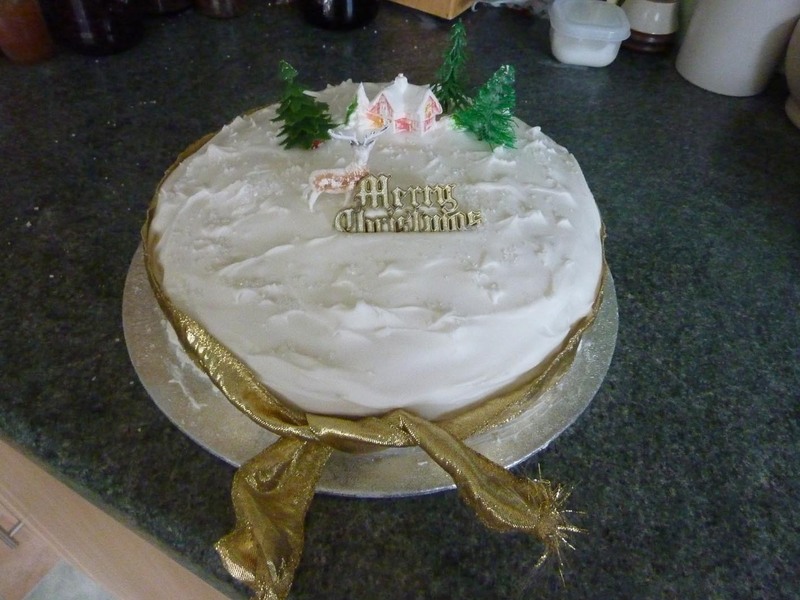 At least the Christmas Cake is ready! I enjoyed your Christmas tale but the link to the Byrhtnoth’s meeting in the snow doesn’t work for me from your email or the online post. Thought I’d let you know. If you have time to read and any comments (any comments are fine positive or contentious) I’d be grateful. Sadly I don;t have a facility to collect followers yet so must get onto that. Thank you for telling me the link didn’t work – that explains why no-one was reading it! I think it is working now. I’ll have a look at your website and try and find something to say. Best wishes for the New Year – I have a feeling that it’s going to be great.